The London Evening Standard and the Jewish Chronicle are reporting that an ultra-Orthodox Jewish group in North London has banned women from driving their children to school. A group of teachers and rabbis reportedly sent out a letter saying women driving goes against “the traditional rules of modesty in our camp.” Children driven to school by their mothers will reportedly be sent home. According to the Chronicle the letter calling driving immodest was sent out by a group of educational institutions affiliated with the Belz, a large sect of Hasidic Judaism. There’s a large Belz community in the Stamford Hill neighborhood in London. The letter also endorsed by a number of Belz rabbis, and indicates that the policy will be enforced by turning away children who arrive at school driven by their mothers. The policy is set to be enforced starting in August, and, according to the letter, was spurred by an increasing number of women driving their children which in turn led to what the letter called “great resentment among parents of pupils of our institutions”. In a joint statement from the Women of Belz Community organisation, directors Chaya Yakter and Neshei Belz said: “As Orthodox Jewish women belonging to the Belz community in London, we feel extremely valued belonging to a community where the highest standards of refinement morality and dignity are respected. “We happen to believe that driving is a high-pressured activity where our values maybe compromised by exposure to selfishness, road-rage, bad language and other inappropriate behaviour. Women driving has long been controversial among haredi (ultra-orthodox) Jews, but most haredi sects agree that it’s not permitted under religious law (“halacha”) on modesty grounds, or what’s referred to broadly as “tznius.” In 2013, Rav Amnon Yitzchak, a prominent rabbi in Tel Aviv, said it’s been immodest for hundreds of years, claiming that women never drove wagons and, thus, shouldn’t drive cars. Growing up, it never dawned on me that driving was a possibility. No woman in my family or neighborhood ever did. We were taught that our tznius, our modesty, would be at stake. But I think there’s something else. For Hasidic women, being banned from the wheel means being tied to your husband and to your community. Driving gives you the keys to freedom and independence. Once my husband and I left the community for a less restrictive Jewish lifestyle, I got my driver’s license. 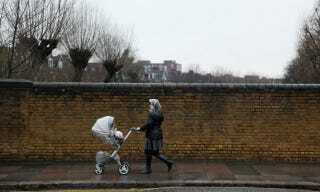 A woman in Stamford Hill pushes a stroller. Image via Getty.